Brett Lee enjoys playing gully cricket and a camel ride in Jaipur! Imagine meeting your idol one day, just in the middle of the road, out of blue. To add cherry to the top, he comes and spends ample amount of time with you. What would be the possible reaction? Shocked? paralyzed for a minute? Believe me, I will go crazy! Indians are die hard cricket fans. And for folks there in Jaipur,they must have been damn excited when the Aussie cricket player Brett Lee came to play the famous gully cricket. 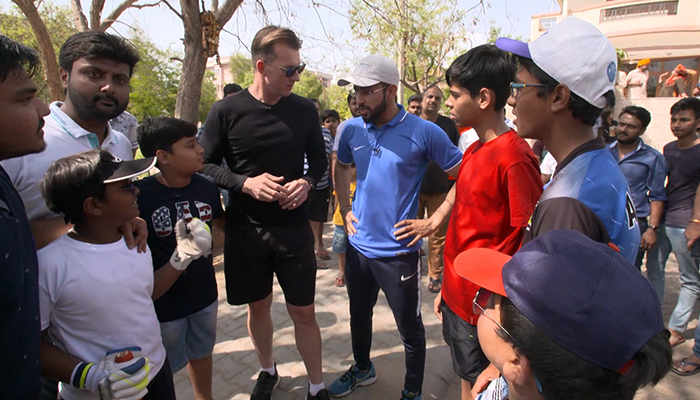 Popularly known as ‘Binga’ for being a very fast bowler, Brett Lee came to meet his young fans and helped them with valuable tips. He’s been seen trying his hands in umpiring as well. Getting coached by your idol must be a dream come true. Rajasthan are popular for camel rides and our binga obviously had to experience it. Indians are famous world wide for their value “Atithi Devo Bhava”. We hope the Dugout Expert for the VIVO IPL 2019, Brett Lee received lots of love and memories to remember in Jaipur. All images are taken from Filmy Mantra.